Usage of foreign sources becomes unavoidable in the countries where country sources and domestic savings are not sufficient to finance economic growth and development. From this point of view, like in the economy of developed or developing countries, external debt is an important finance in Turkey’s economy. The main purpose of this work is to try to show the relationship between economic growth and external debt, in Turkey. For this aim, the annual data which shows the external debt and GDP of Turkey economy, between 1987 and 2014, were used. The variations which existed from 1987 to 2014, were obtained as annual data from the World Bank database. The stationarity of time series, which were used in the analyses, were examined with Augmented Dickey Fuller (ADF) tests. As a result of the ADF unit root test, it was seen that; external debt and economic growth variables have a unit root, with constant and constant-trend, in the level; and, they are both stationary in the first difference. Itis a matter of that there is two-way causation relation from external debts variable to fixed capital investments variable. 1. Zerenler M., Devletin Dış Borçlanmasının Türkiye Ekonomisi Üzerine Etkileri, SÜ İ.İ.B.F. Sosyal ve Ekonomik Araştırmalar Dergisi, 2012, p.187. 2. Akdoğan A, Kamu Maliyesi, Gazi Büro Kitabevi, 4.bs., 1993, Ankara. 3. Mohamed, Mutasim Ahmed Abdelmawla, The Impact of External Debts on Economic Growth: An Empirical Assessment of the Sudan: 1978-2001, Eastern Africa Social Science Research Review, 2005, 21, p.53-66. 4. Schclarek Alfredo Dept and Economic Growth in Developing and Industrial Countries, Lund university Department of Economics Working, 2004, PO Box 7082, SE-220-07, p.2. 5. Babu, J. O., Kiprop, S., Kalio, A. M. and Gisore, M. “External Dept and Economic Growth in The East Africa Community”, 2014, Vol.8(21), pp.1011-1018, Nowember. 7. 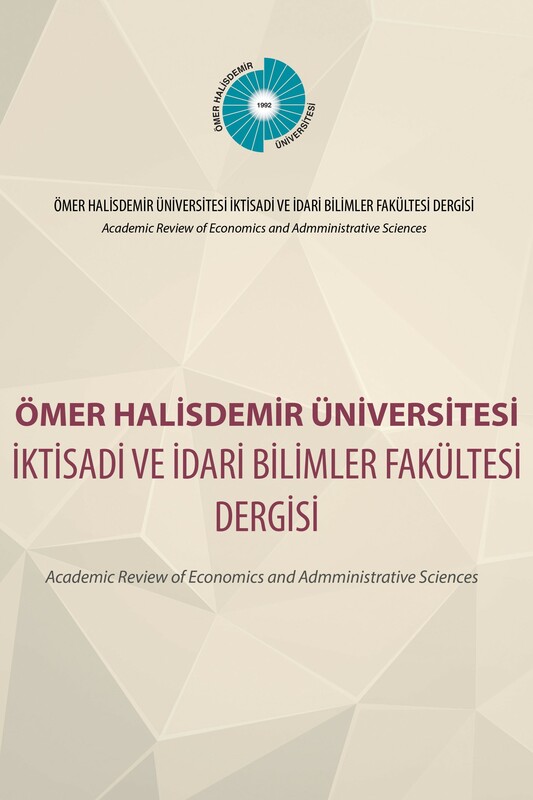 Erataş Filiz and Başçı Nur Hayriye, Dış Borç ve Ekonomik Büyüme İlişkisi: Yükselen Piyasa Ekonomileri Örneği, Marmara Universitesi İ.İ.B.F. Dergisi, 2013, Volume XXXV, Issue:II, pp.207-230. 8. Çöğürcü, İclal and Orhan Çoban, Dış Borç ve Ekonomik Büyüme İlişkisi: Türkiye Örneği (1980-2009), KMÜ Sosyal ve Ekonomik Araştırmalar Dergisi, 2011, 13 (21): 133-149. 9. Lin, Shuanglin and Kim Sosin, Foreign Debt and Economic Growth, Economics of Transition, 2001, 9 (3): 635-55. 10. Patillo, Catherine, Poirson, Helene ve Lucca, Ricci, External Debt and Growth, IMF Working Paper, 2002, WP 2/69. 11. Frimpong J. M., and Oteng-Abayie E. F., The Impact of External Dept on Economic Growth in Ghana: A Cointegration Analysis, Journal of Science and Tecnology, 2006, 26(3), p.122. 12. Safdari, Mehdi and Masoud Abouie Mehrizi, External Debt and Economic Growth in Iran, Journal of Economics and International Finance, 2011, p.322-327. 13. Ogunmuyiva M.S. “Does External Dept Promote Economic Growth in Nigeria?, Current Research Journal of Economic Theory, 2011, 3(1):29-35. 14. Shah Mahmud Hasan and Pervin Shahida, External Public Dept and Economic Growth: Empirical Evidence from Bangladesh, 1974 to 2010”, Academic Research International, 2012, 3(2), p:508. 15. Kasidi Faraji and Said A. Makame, Impact of External Dept on Economic Growth: A Case Study of Tanzania, Advances in Management & Applied Economics, 2013, 3(4), pp:59-82. 16. Zouhaier Hadhek and Fatma Mrad, Debt and Economic Growth, International Journal of Econimics and Financial Issues, 4(2), p:440. 17. Iyoha, M.A., External Debt and Economic Growth in Sub-Saharan African countries: an econometric Study, Nairobi, and AERC, 1999. 18. Ajao M. G. and Ogiemudia, Foreign Debt Management and the Development of Nigeria Economy, Review of Economics and Finance, 2013. 19. Kırcı Çevik Nüket and Cural Mehmet, Dış Borçlanma ve Ekonomik Büyüme Arasında Nedensellik İlişkisi:1989-2012 Dönemi Türkiye Örneği, Maliye Dergisi, 2013, 169, p.115. 20. Gül Ekrem, Kamacı Ahmet and Konya Serkan, Dış Borcun Büyüme Üzerine Etkileri: Orta Asya Cumhuriyetleri ve Türkiye Örneği, International Conference on Eurasian Economies, 2012, p.169. 21. Bilginoğlu Mehmet Ali and Aysu Ahmet, Dış Borçların Ekonomik Büyüme Üzerindeki Etkisi: Türkiye Örneği, Erciyes University İ.İ.B.F. Dergisi, 2008, 31, pp.1-23. 22. Uysal Doğan, Özer Hüseyin and Mucuk Mehmet, Dış Borçlanma ve Ekonomik Büyüme İlişkisi: Türkiye Örneği, Atatürk Üniversitesi İ.İ.B. Dergisi, 2009, 23(4), p.161. 23. Ulusoy, A. and Küçükkale, Y., The Effect of the External Debts on the Economic Growth and the Inflation Rate in Turkey, Ekonomik Yaklaşım, 1996, 7(21), pp.13-25. 24. Dickey, D. A. and Fuller, W. A., Distribution of The Estimators for Autoregressive Time Series with a Unit Root, Econometrica 49, 1981, pp.1057-72. ISNAD ÖZTÜRK, Serdar , KILIÇ, Nazife Özge . "Dynamical Relationship Between Economical Growth and External Debt The Case of Turkey: (1987-2014)". Ömer Halisdemir Üniversitesi İktisadi ve İdari Bilimler Fakültesi Dergisi 10 / 2 (May 2017): 86-95.